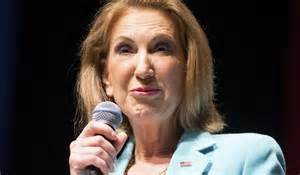 Who is This Carly Fiorina, and Is She a Contender? Looks like there’s a new emerging star among the field of 16 or so candidates seeking the Republican nomination for its presidential candidate. If political pundits are correct, Carly Fiorina was the top-dog debater during Wednesday night’s CNN-sponsored Republican presidential debate in Simi Valley, California. Ms. Fiorina, who has never held political office, reportedly trumped (pardon the pun) her more political astute colleagues on the stage, as well as front-runner Donald Trump, who has also never held political office. The Donald, who has been rebuked for disparaging comments he’s made about other women–such as calling Fox News host Megyn Kelly a “bimbo”–later back peddled and said that he was talking about her “persona,” not her physical looks. He also claimed that his negative comments about women were being made in the context of him being “an entertainer,” implying that they are made for the sake of humor. In rebuttal to Trump’s comments, and in a move that brought her more attention, Ms. Fiorina in a speech to the National Federation of Republican Women, said, “Ladies, look at this face. This is the face of a 61-year-old woman. I am proud of every year and every wrinkle.” And then, during Wednesday’s debate when asked to respond about The Donald’s original comment about her appearance, replied, “I think women all over this country heard very clearly what Mr. Trump said.” In short, Ms. Fiorina was essentially implying that Trump could kiss the women’s vote goodbye. For our part we’re not going to comment on Ms. Fiorina’s beauty, or whether there’s a lack thereof; however, we do wish she’d quit jerking her head around so much while speaking. With her pencil-thin neck it makes her look like a hyperactive bobble-head doll. During the debate Ms. Fiorina promoted her strong conservative leanings by emphasizing the need to significantly increase America’s military, defund Planned Parenthood, and keep fighting the “War on Drugs.” She also successfully jabbed and parried with her colleagues on the stage, with many pundits claiming that she bested Jeb Bush, Chris Christie and The Donald when she one-on-one sparred with them, and that she proved to be the best debater of the night. But can she really take the Republican nomination? Ms. Fiorina’s only other foray into politics was the 2010 Senate race in which incumbent Sen. Barbara Boxer defeated her by 10 percentage points. While Ms. Fiorina ran on the strength of her strong business credentials, which includes becoming the first female chief executive officer of a top-20 Fortune 500 company, it was those very credentials that likely lost her the Senate race. As the Boxer campaign pointed out, during Fiorina’s five-year stint as Hewlett-Packard, 30,000 U.S. HP workers lost their jobs and the company’s stock price dropped 50 percent, all while her salary tripled. Ms. Fiorina defends her record at HP by stating that she ran the company during a difficult time and had to make “hard choices,” but that those choices ultimately made the company stronger. She repeated this line during Wednesday’s debate and noted that she also presided over one of the largest mergers in corporate history. Despite Ms. Fiorina’s rebuttals, her troubled tenure at HP, along with subsequent firing, will undoubtedly continue to haunt her during this campaign. Just go to the website carlyfiorna.org for an example of how badly this could haunt her. —Originally published Sept. 18, 2015 by Hash It Out!